(Columbine (Aquilegia canadensis) - 04) The patch of columbine pictured here are often referred to as "wild columbine" or more technically, Aquilegia canadensis since their discovery in early American Canada. 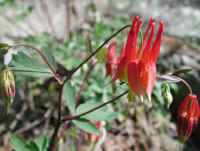 Columbines are members of the Buttercup family. 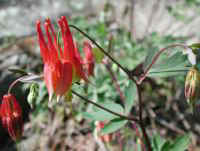 We have been observing this patch of columbine at this particular location in Sleepy Hollow Lake for over 20 years. (Columbine (Aquilegia canadensis) - 01) In this close up view of one of the columbine flowers in the previous photo, we can observe the marvelous and many faceted beautiful traits of the wildflower which is only a little over one inch long in real life. When Mary and I look at the glorious details, we often imagine the joy God had in making it. 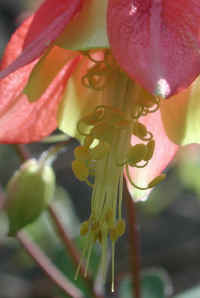 (Columbine (Aquilegia canadensis) - 05) In this ethereal image of the columbine, we are looking up into the bowl of the wildflower with its five chambers or tubes of the five spurs in which the nectar is formed. 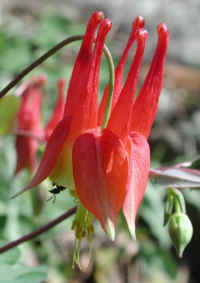 The columbine flowers are a favorite of hummingbirds. 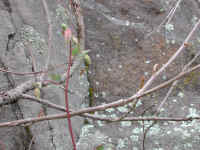 (Columbine (Aquilegia canadensis) - 06) We spotted this budding columbine growing out of a degraded section of a rock outcropping, which is one of the columbine's favorite habitats. 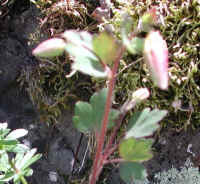 (Columbine (Aquilegia canadensis) - 06a) This photo gives us a closer look at the buds of the wild columbine. 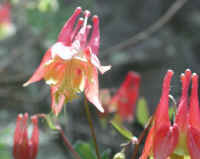 Columbines bloom from April until July, depending on the climate. 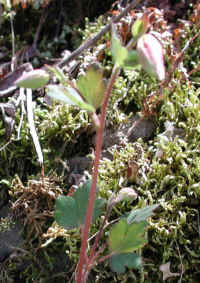 (Columbine (Aquilegia canadensis) - 07) This photo shows the kind of habitat where columbines are likely to be found. 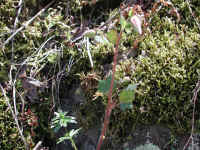 They also like shaded places such as woodlands and even can be found growing on mostly shaded and moist cliffs. (Columbine (Aquilegia canadensis) - 07a) Once the weather has warmed in early spring, the columbines begin to sprout and send up rather long stems. 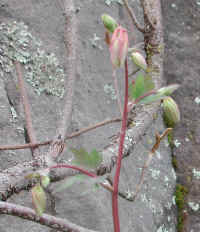 Soon the flower stems being to sprout from the upper leaf axils in rather long nodding or drooping arches with their buds generally hanging downward. (Columbine (Aquilegia canadensis) - 08) The other common name for the columbine, rock bell, most likely comes from the fact that columbines like rocky habitats and from the way the flowers hang down from their drooping or nodding stems. (Columbine (Aquilegia canadensis) - 08a) The common name of the columbine apparently comes from the appearance of the flower looking to some people as a circles of doves (Latin: columba) drinking around a fountain. 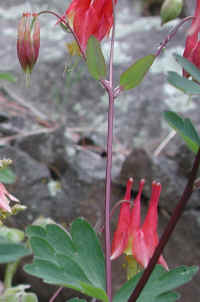 An equal stretch of the imagination led to the generic or scientific name, Aquilegia, because the knobbed spurs looked like the talons of an eagle (Latin: aquila). 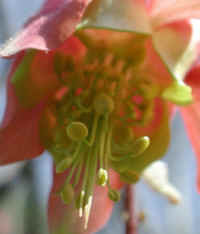 The head of a visiting ant can be seen looking out from under the left side of the columbine flower. 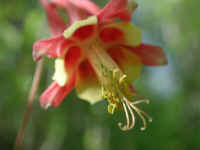 (Columbine (Aquilegia canadensis) - 09) In this bee's eye view, we're looking up into a columbine flower with its numerous stamens and five pistils, which project beyond the petals. (Columbine (Aquilegia canadensis) - 10) This is another photo looking up at the bowl of a columbine flower. 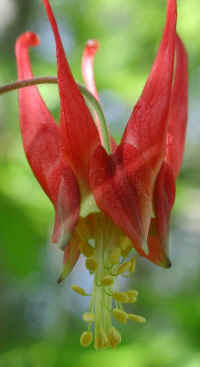 (Columbine (Aquilegia canadensis) - 10a) The petals of the columbine form 5 funnel shaped cavities within the bowl of the flower, each one terminating in a spur. 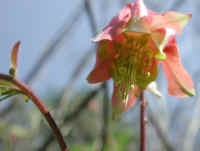 Three of these funnel shaped cavities can be seen in the base of the flower (near the top of photo). The sunlight glistening on one of the stamens highlights the pollen grains. 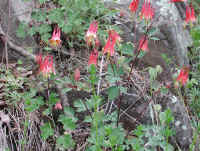 (Columbine (Aquilegia canadensis) - 11) This is a patch of wild columbine growing in a rock outcropping on the edge of the woods. (Columbine (Aquilegia canadensis) - 11a) The distinctive compound, divided, and subdivided leaves of the columbine make this wildflower relatively easy to identify even when it's not in bloom. 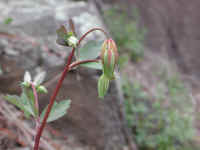 (Columbine (Aquilegia canadensis) - 12) This is another photo of a portion of the patch of columbine growing in the rocks. (Columbine (Aquilegia canadensis) - 12a) This is another photo of the wild columbine. 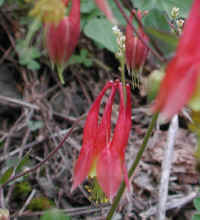 (Columbine (Aquilegia canadensis) - 13) Two of the inner funnel shaped petal folds can be seen in the one columbine flower. 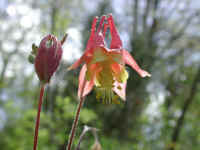 (Columbine (Aquilegia canadensis) - 14) This is one of the few photos we've been able to take in which we can distinguish all five pistils: there are two to the left, two close together in the center, and one to the right. We also find it very interesting to see the way the stamens develop: there seem to be three groupings, one group near the top of the flower (bottom of photo) that are straight and surround the pistils, and below that are two other groups that are curled. In this photo, we can also see some of the crinkled surface of the petals. 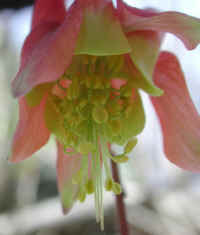 (Columbine (Aquilegia canadensis) - 15) Like a work of art, these columbine flowers brighten and glorify a portion of God's creation. 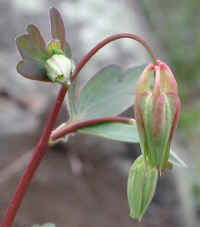 When food was in short supply early Native Americans boiled and ate the columbine roots. (Columbine (Aquilegia canadensis) - 16) We enjoyed the way the early morning sunlight, shining from the rear, glistens on the short moist hairs of the opening columbine flower. (Columbine (Aquilegia canadensis) - 17) Before the columbine flowers open, they can be hard to see among the other green plants, unless you are specifically looking for them. (Columbine (Aquilegia canadensis) - 17a) This is a closer look at the previous photo of the budding columbine. 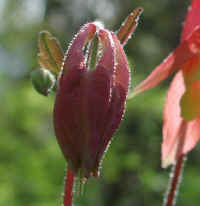 (Columbine (Aquilegia canadensis) - 18) This is another look at the columbine flower in its buding stage.